I should be going to bed, but I've decided to post an update about the last couple of months. October was extremely busy. It included a one day trip to Pittsburgh, a camp-out with Girl Scouts, lots of soccer, report cards, parent teacher conferences, and a weekend women's retreat. The retreat was wonderful, but the busyness of life hit me square in the face as soon as I got home. By the end of the month, I desperately needed a weekend at home. November has been slower and easier to deal with. That even includes our weekend away in New York City. What an adventure that was! We got on a bus at 9:00 on a Friday night and were driven to NYC. By 8:30 in the morning we were looking at the Statue of Liberty and had a full day of experiences very unlike those we have at home. We got back on the bus at 9:00 pm and were driven back to Ohio. We were home by 6:00 Sunday morning. So, how am I dealing with my hearing loss? Well, basically I'm so busy I don't think about it much. I adapt when I need to adapt. I get frustrated once in a while, but not a lot. I see that I am capable of just about anything still. I know that I do miss my hearing and wish that it was easier. One of my most difficult days was at my last ENT appointment. Because of a scheduling mix up, I did not have a hearing test. The doctor asked how I was doing and if I thought that I would want something to help me with my hearing loss. I feel like I'm adapting well, but really think life would be easier, especially in the classroom with some hearing help. Being the pleaser that I am, I wanted to do what the doctor thinks I should do. If he thinks I can live without hearing aids or surgery, then I wanted to live without those things. But here's the thing... the doctor is not hard of hearing and I am an... adult. This is MY decision to make. He can't know how easy or difficult things are for me. He can't make this decision for me. I was quite anxious for a day or so, while I worked through these issues. Well, that sums up the last couple of months. On to the last month and a half of 2010! I have some sermon notes from the most current series of sermons - Are You Smarter than a Fifth Grader. I thought I would write a couple of blogs with the material that popped out at me. 1. Don't be afraid. Sometimes you will need to stand alone. 3. Don't underestimate the power of one totally dedicated life. Number 3 really popped out at me. I try to be dedicated, but sometimes I just really mess up. I pray that my life will still have a positive effect on others. During this sermon, the preacher also talked about blame displacement and how we should take responsibility for our actions. Its not always easy to do that, but I do believe it is important. Well, my baby is now 10 years old. Within the next few years we'll need to have many "talks." Last week was one of them. I was tipped off by grandma that it was time to have one of those talks. Mikayla came home from school and said that her friends said that the tooth fairy is... get this... your parents! Me: Your grandma said you were talking about the tooth fairy today. What were you saying? Mikayla: My friends say that the tooth fairy is your parents. Me: Well what do you think? I laughed so hard that I cried and then continued the conversation. Me: So why do you think parents would lie about something like that? Mikayla: So kids can have fun. Me: Yep. That's pretty much it. Do you want to keep pretending so you can still get money for your teeth? I'm not sure I ever got a straight answer on that one. Guess we'll find out the next time she loses a tooth! Inservices - you've got to love them. Okay, not really. One particularly "fun" inservice was about the power of an "incomplete" over a "zero" grade in the grade book. Without going into the entire six hour inservice, let's just say that I'm giving myself an "I" for this years mini-goal resolution thing I had going on from January through June. That's so much better than giving myself an "F," right? I know... I made goals for July too, but I completely and utterly failed at even getting remotely close to accomplishing either of them! So I now have an "incomplete." You know what? I can live with that. In fact, I HAVE to live with that. Every day I will wake up with stuff to do and I will go to bed with stuff to do. I will never be done. Until I die. Then I will have a "completed." Of course I will still make goals. Goals help drive us. In fact, I do have a new goal. It's a big, scary, and exciting goal. And that's all I'm saying for now. Vintage Post #6 - Blog, Blog, Blah! If you want to read something funny or useful here, stop reading now. You WILL be disappointed. Blah. That's how I feel. There's more to it than that though. It's not even really a blah feeling, but that's about the way I need to describe it right now. Describing it more would not be useful. So I blog about nothing. Really it's not nothing though. It is something. Okay, time for a couple of real goals this month. The second goal is to learn 31 American Sign Language signs. I took a couple sign language classes at a church during college, but never stuck with it. This is actually the beginning of week 9 of my sudden deafness, but I had a doctor's appointment in the middle of week 7. A friend from work highly suggest that I see Dr. Lippy from the Lippy Group in Warren, OH to get a second opinion on my hearing loss. I went through all the hearing tests again and his opinion was the same as my doctor in this area - sudden deafness, 50/50 chance of regaining hearing in my left ear. My doctor in this area told me that if I didn't get my hearing back that hearing aids were not an option, but there were other things we could do to help me. He didn't discuss it with me at that point because I'm pretty sure he wanted me to focus on the steroid treatments and having a positive attitude about all that. Perhaps he didn't want to scare me. Anyway, the chief of audiology at Dr. Lippy's told me what that option is - a bone anchored hearing aid (BAHA). The chief of audiology also suggested that I may get used to just hearing from my right side. I can see how that could happen, but with being a teacher I feel that the BAHA would help me out immensely. At times with good hearing, it is difficult to understand students with speech problems and who like to talk softly. I think a BAHA would help reduce frustration on my part, as well as for the students. I know that it is possible for me to get my hearing back. God is amazing and He will work in my life - if not in one way, then in another. I appreciate the prayers that are being said for me! Half-way through June and I haven't posted my mini-goals yet. Instead of making mini-goals, I'm going to make a list of things I've already accomplished. I've been so busy and have lots of things I still need to do. Making mini-goals seems pointless this month since I seem to be crossing things off my invisible to-do list everyday. Worked on decluttering my classroom for an extra day. Helped at Mikayla's field day. Met with someone to discuss hearing loss. Planned and executed Mikayla's birthday party. Took Girl Scouts to Haven of Rest and Children's Hospital to drop off donations. Got a second opinion on my hearing loss. Went to dentist appointments for myself and Mikayla. Went for a medical check-up. Scheduled and attended a ceramics class with the Girl Scouts. Scheduled an overnighter at the zoo for the Girl Scouts. Did some decluttering and preparation for a yard sale. Started plans for our summer vacation. Take Mikayla to the orthodontist. Finalize plans for the zoo trip. I have been so busy this month. I wonder how I do everything I need to do during the school year when I'm working. Somehow I get it done though. Where's my summer vacation going already?!?!? June Goals - Stick a fork in me... I'm done! Two of Mikayla's favorite things right now are peace signs and frogs. In fact, she just chose a geocaching name and it is PeaceGreenFroggy. That is also what she chose for the theme of her birthday party. After making her a Barbie cake and a dog-shaped cake for two different birthdays, my first thought was, "Yeah! Peace signs are round! First I frosted the cake with white buttercream frosting. Next I piped on the peace sign outline with store bought icing in a can that came with decorator tips. That didn't go so well. I like using the frosting bags and decorating tips a lot more. Finally, I dropped drops of food coloring directly on the cake and used a fork to spread out the coloring. Here's what I came up with for the frogs. These were very easy! Green frosting. Cut marshmallow in half. Put the sticky side of the marshmallows up and stick a chocolate chip to them. (I think M&Ms would work better, but I used what we had.) Pipe on red mouths. I don't know what it is about decorating Mikayla's birthday cakes and cupcakes, but I really enjoy it. It's turned out to be a nice tradition! One of the things I like about going on vacation is eating out and trying new foods. While we were in Myrtle Beach for spring break, we found a pizza restaurant named Mellow Mushroom. I coaxed my daughter and husband into trying the "Hot Potato Pie." Hey, how can you go wrong with crust, potatoes, bacon, and sour cream? We loved it! When I got home, at some point, I thought, "Hey I can do that! Basically it's just crust, potatoes, bacon, and sour cream!" I tried it a few weeks ago and we all loved it again. So I made it again last night and took a picture. It's not exactly like the one at Mellow Mushroom, but still really good! Of course I used all the best short cuts to make it and rolling out the dough in a perfect shape makes no sense when you're hungry! I used a package of pizza crust mix and followed the directions to make it. On top of that I put a sour cream and cream cheese mixture - probably about a cup of sour cream and 2 ounces of cream cheese. Next I added about 3 slices of diced, microwaved bacon and a microwaved, diced potato. Finally, I sprinkled on shredded colby and monteray jack cheeses and baked the pizza according to the crust mix directions. I made two of these last night. I refrigerated 5 slices. They were gone before I woke up this morning. That's how it works around our house if something is really good! Goal 1 was successful. I posted scripture as my status on Facebook. I think it was positive for me and it helped me keep my focus. Goal 2 was not as successful. I will give myself half credit. I wrote out 16 verses and most of them are hanging around the house. I need to post a few more still. This week has been interesting since I am out of school and Mikayla is still going. It has been busy and I can't believe it is going so fast. I have been very tired in the afternoons and needing a nap. It seems my body needs to adjust like this every summer. Time to start thinking about June goals! I had a rough time at church this morning. As I listened to the music the thought, "This isn't the way it's supposed to sound," came to mind. Only hearing from one ear doesn't give the music the fullness I'm used to. My voice sounds different to me when I sing and I can't hear the others around me as well. Along with that, the vibrations of the music and the tinnitus (ringing in my ears) were difficult for me this morning. As we sang, "Oh how he loves us," I know that is true. He knows I'm going through a difficult time with this. He cares for me and will carry me through this, no matter what the answer is. Mikayla answers and says hello and then hangs up. I asked who it was. She replys, "It was about the election. He said something about Democrats, so I hung up." Sunday, May 16 - Wednesday, May 19 - Most of the week, I was pretty grossed out about the idea of having a hole in my eardrum. At the same time, I was praying that it wouldn't close up so that the doctor would not need to numb and re-lance my eardrum. As the week wore on, it didn't gross me out as much... or I just got busy and didn't think about it as much. Thursday, May 20 - Since Jason worked this Thursday, my friend said that she would drive me to my appointment and then take me to a geocache event afterwards. The hole was still in my eardrum, so the doctor just need to remove the scar tissue and inject the steroids. He said everything went as it should. I will go back in 4-6 weeks to have a check-up and a hearing test. I missed most of the geocache event, but got there in enough time to say hi to everybody. Mikayla, my friend, and I still enjoyed a good meal at Beef O'Brady's. Friday, May 21 and Saturday, May 22 - Jason, Mikayla, and I did a "Missions Marathon" at church. Not being able to hear from one ear has made listening and communication more difficult. It brings up a lot of questions like... How many times should I have someone repeat themselves when I don't understand them? When should I just smile and pretend I heard them? Should I mention my hearing loss? Is a hearing loss a big deal, or am I making too much of this? What can I be doing to make all this easier? Because my next appointment will not be for a month, I won't be doing weekly updates on my hearing loss. In the meantime, if I am so inspired to blog about my hearing loss, I will. This is a summary of what happened this week. Monday, May 10 - The nurse from the medical center scheduled my appointment for the audiologist and specialist. I was able to get in Monday evening! Wouldn't you know there was a wreck, making me half an hour late for my appointment. My hearing test came back that I have a 60-70 decibel hearing loss in my left ear. I scored 100% on my word recognition test for my right ear and only 36% for my left ear. The quality and quantity of hearing is not good, so at this point I am not a good candidate for a hearing aid. It was confirmed that I have a 50/50 chance of getting my hearing back. I was told I could continue oral steroids or get steroid injections into my ear. I opted for the injections. The specialist said that having been on oral steroids already and the amount of my hearing loss, that he thought that would be the best as well. The injection was scheduled for Thursday at 6:00. Tuesday, May 11 and Wednesday, May 12 - Waiting and praying. Went to the church Wednesday evening to talk over all that was happening with one of our preachers. Thursday, May 13 - Jason took me to the hospital for the injection. The first thing I had to do was have numbing gel applied to my eardrum. I wasn't really expecting the application of the numbing gel to hurt at all, but then I've never had my eardrum touched before. Learned something new I guess. After it had time to numb, the doctor began the procedure where he lanced my eardrum and inserted the steroids through a needle into my ear. Because of the numbing gel, I felt very little. I concentrated on being very still, so that things would go exactly as they should. The steroids were cooler than body temperature and I could feel that, but it was not really that uncomfortable. After the injection, I had to stay very still and not swallow for about 20 minutes, so the steroids would go where they were supposed to. When I was able to get up, I felt a bit dizzy, but nothing too major. This next week, if my eardrum does NOT heal, they will be able to go in through the same hole as this week and I will be able to skip the numbing step. Friday, May 14 and Saturday, May 15 - My next injection was scheduled for Thursday, May 20th at 5:00. I can honestly say that I'm still kind of grossed out by the injection. The whole idea of having a hole in my eardrum freaks me out, although I'm definitely praying that it does NOT heal by this coming Thursday. Thank you to those of you who have been praying for me! So, we're sitting in the living room watching some tv. Mikayla has the Magna Doodle out and I look down at it. She has divided it into four sections labeled - Mom (farts), Moe (farts), Mikayla (burps), Dad (farts). Beneath each label is tallies of the gas released this evening. What's my next move? Enter her into counseling or contact the government to let them know our family may be the answer to the gas shortage? About half way through the month... time to post some goals, huh? I truly wasn't sure what to make my goals until yesterday. May is always a busy month, with the end of school at hand. This May started out with a strange glitch though. Several days before May started, I woke up not being able to hear from my left ear. I quickly made an appointment with the nurse practitioner and started antibiotics. A few days later, she called in a prescription for an antihistamine and a couple days after that a new antibiotic and a steroid. A week later... still no hearing. I saw my family doctor and he prescribed a higher dose of steroids and said if my hearing wasn't back, I should call them to schedule and MRI. MRI was scheduled and came back clear. Exactly two weeks from my initial hearing loss, the ear specialist was wonderful and scheduled and appointment for me QUICKLY! The audiologist gave me a hearing test and it showed that I had a severe loss of hearing in my left ear. The specialist said that I have "Sudden Deafness" and I have a 50/50 chance of getting my hearing back. Yep. Just like that. I could hear from my left ear and then not the next. I want to strengthen myself against attacks of depression and negative thoughts. Hopefully my goals will help me with that. Goal #1 - Instead of a status on Facebook each day, I would like to post a Bible verse through the month of May (starting on the 11th). Anything else I want to say, I can add a comment BELOW the verse. Goal #2 - Write out and post 31 verses around the house. There it is - May goals! Mini-Goal 2 is complete... both parts! I took a trip to Kohl's and managed to buy 2 spring tops, 2 pairs of khakis, and a pair of jeans. At Wal-Mart, I found 2 pairs of shoes! One pair of my same old, same old that I like to wear and a pair of sandals that could be worn to work, if I wanted. Part 2 of the mini-goal was to make a doctor's appointment I didn't want to make. Well, I'm happy to say that on April 30th around 4:20 pm (10 minutes before the office closed), I called to make my appointment! It's hard to believe four months of 2010 has already past! On to month five! Vintage Post #3 - More Power to Ya! Sunday we lost our electric around 6:30 pm. It didn't come back on until sometime in the early morning on Tuesday. Since our well is powered by electric, we also did not have water. Even though we didn't have electric power, we still had power - the power of friendship. While I was there, I also found out that they could use their water, since they have city water. They allowed us to get showers there also. 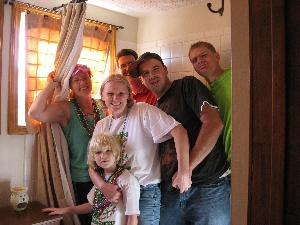 Along with these friends that helped us out tremendously, my sister had offered to let us get showers at her place and a co-worker who lives close and had her power offered the same. My cousin also checked in to see how we were doing. I feel blessed to have so many great friends and relatives so close to me! They give power and meaning to life! Okay, I'm slacking. It's over mid-way through April and I still haven't posted my goals. So here goes - and yes, I'm going to cheat a little. Goal 2 - Make a doctor's appointment I don't want to make and buy some clothes I don't want to shop for - specifically one pair of khakis that reach below my ankles, two spring tops, and a pair of shoes suitable to wear to work. I made two parts to this goal, because I already cheated on the other one and the first part of this goal only requires a phone call. Now I'm ready to make one of my May goals. It can be to ACTUALLY GO to the doctor's appointment I don't want to go to! We threw a few pieces of kettle corn that we had with us and then examined the area for eggs. We saw quite a few in the water, like we did a couple weeks earlier and also found a couple under a bush. Mikayla walked around the edge of the pond and was acting like a duck. I asked her if she was ready to go. Her reply was, "No! Wait! I'm not done insulting a duck." I had to chuckle and ask if she meant "impersonating." With no clear answer, I asked her if she knew what "insulting" meant. She said that it meant being rude. So hours later as I type this, I'm still not sure if my daughter was "insulting a duck" or "impersonating a duck" today. Or perhaps it was a little bit of both! In July, something possessed me to say okay to a puppy. You would think that I would have had better judgment from our previous experience. We got Moe in the summer of 1999. Mikayla was born in Summer of 2000. My comment, "Boy, having a baby is a lot easier than having a puppy!" So this summer as I exercised one of my bad habits, going into a pet store "just to look," a pretty black lab puppy looked at us just the way puppies know how to look to get you to fall in love with them. We were hooked on the 10 pound cutie. We bought her and named her Reagan. My main frustration isn't even her fault. It's mine/ours. We've gotten used to going out and doing things - taking day trips and leading a very busy schedule. Moe is older and has adjusted to it. However we can't maintain the same schedule with a new puppy. I feel guilty going out and leaving her at home. Our schedule for the moment is now dictated by this little hound. As the months go on, I know that she will be able to go longer without needing us at home. I also hold the hope that one day she will settle down enough and be potty trained enough that she will be able to roam the house like Moe when we are gone. Right now it's nice to know that she will not get hurt or ruin expensive items when we are away. Oh yeah, and that 10 pound cutie... she's almost 30 pounds! March Goals Complete with Pics to Prove! Taxes are done! This is the first year in a long time they've been done this early. Also, all three areas of my kitchen are decluttered. Much of the junk has been thrown away! Lots of things were in the wrong place. The mixer was transferred to its place next to the microwave. Girl Scout cookies were delivered and several things from this spot were thrown away. Okay, so there's still not any bread in the bread box and I'm not telling what is! One of the shelves in our cupboard broke and that why all the bottles of stuff were on the counter. The sugar and flour containers were moved back to where they belonged and LOTS of stuff in this pic were thrown away, including old cocoa mix, valentine cards, candy, granola, and some papers. I also filled up a small box of stuff for the garage sale I hope we have someday. What an improvement! I hope I keep it this way! Wow! The Christmas decorations are downstairs, as well as the big old trunk of junk. Old cereal and chips were thrown away and all the shelves were cleaned and organized. My first vintage post, if 2008 counts as vintage. (Check out this discussion about antique vs. vintage if you have any questions about the meaning - http://forums.ebay.com/db2/topic/Antiques/Antique-Vs-Vintage/400098219.) I was posting a blog on myspace, however since I am now a facebook devotee I don't visit myspace very often. I would like to transfer all my blogs over to my blogger account bit by bit, so I can eventually cancel my myspace page. So, every so often I will copy and paste one of the blogs here. Well to start off with, I think I'm going to start blogging here instead of my blogger page. I don't think anyone ever looks at my blog over there. I don't blame them of course because I don't keep up with it very well. 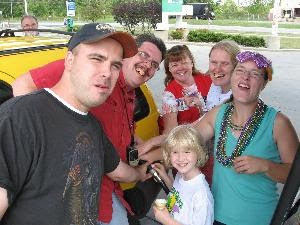 Yesterday Jason, Mikayla, Eric (family friend), and I attended Mardi Gras: Cachers Gone Wild. We attended the event last year and loved it! We never realized how awesome this years event would be. When we got there, we teamed up with Mohana and MacFarlane (caching names) to make our day even more fun! This year we were given playing cards with dares and a point value on them. We had to take pictures and try to get the most points in our photos. We sat in a circle with bare feet next to a giant rooster, kissed a bald stranger's head, and ate Mentos with a store employee while pumping a man's gasoline. I have to say that my favorite photo we did was the one where we stopped by a party and asked if we could use their bathtub. The owner wasn't home because it was a surprise birthday party for her. We finished with the picture right as she got home. We reentered the bathtub as her friends escorted her to the bathroom and we all wished her a happy birthday as she asked who the heck we were! The partiers loved it and were snapping pictures with their own cameras! Out of the 70 teams, we came in 6th place. We had such a great day laughing and having fun! We even found some caches during the event as well! Goal number one for March is to get my taxes done by the end of the month. I usually put this off until the first couple weeks in April. It makes my mom and dad nervous. Okay, here it is... it's a risky one. I'll take three pictures of cluttered parts of the kitchen and post them. By the end of the month, I will declutter/organize those areas of the kitchen and then retake pictures to post. I guess we'll all see how that goes! February - both goals completed. The one goal was getting the Girl Scout bank account in order. I balanced the checkbook and wrote down all the transactions that happened before we had the account. I still owe myself money, but I need to get some checks signed by my co-signer, before I can write anymore. The other goal was to read two books over 100 pages. I definitely exceeded that goal. The first book I read was "But Inside I'm Screaming" by Elizabeth Flock. It's about a news reporter who goes off the deep-end and has to go to a mental institution to recover. It was okay, but I wasn't overly impressed with the book. Impressed with myself - yes! A 316 page book read completely - it's been a while since I've read one that long. The other book I didn't exactly finish, but I did read over 100 pages of it. It is the book "Succulent Wild Woman" by Sark. I was inspired to reread this book after a friend from college read one of Sark's newer books and posted a blog about it. I enjoy reading Sark's books. I love her positive outlook and bright artwork that accompanies her books. Her view on napping completely coincides with mine! I also like that I have to think about what she writes, because although I enjoy many of her thoughts and beliefs, not all of them align with mine. Ever since Moo was little and we come home with the groceries, she sets up her own little store. It's a simple little store. The boxes of pop are set up as the scanner and she unpacks the groceries. As she takes each item out of the bag, she runs it over the "scanner" and say, "Beep!" for each item. It is amazing to me that at the age of 9 years, she still continues to do this. It makes me smile to see her enjoy something so simple. Today, she decided to take the eggs from the carton and put them into the egg tray from the fridge. She picked up each egg, examined it, said "Check! ", and then put them into the tray. How God has blessed me with simple moments like these! The older I get, the less I like the cold weather. I certainly see why my grandparents were snow birds, living in Ohio from April to November and on Big Pine Key in Florida during the winter months. A couple times during the winter, I convince myself to get bundled up and play in the snow with Moo. On this particular day, we started out by having Moo take pictures for an American Girl photography contest. We ended the day by making snow sculptures. The snow wasn't packing well enough to make a snowman. For the contest, Moo had to take pictures of five things from a list of twenty. She started out taking a picture of a pine cone. This one was a bird feeder she made and hung in a tree with Jason. Animal tracks in the snow was another on the list. We found cat prints and rabbit tracks! We found an "interesting icicle" on our neighbor's garage. I love this picture Moo took of "a tree with no leaves." Check out the garage in the background compared to the tree. This tree is huge! The final picture for the contest was something in nature that looks like a letter of the alphabet. We took the easy way out and chose the letter "V."
From there we moved on to our snow sculptures. We had lots of fun in the snow! Now I'm ready for spring! I don't forward a lot of e-mails. I guess I figure that everyone is getting forwarded e-mails and ends up pretty much getting the same stuff anyways. Every now and then I will get one that I really like. I received this e-mail forward in early January. It is from a friend who has struggled with a situation in her life for several years and is hoping the biggest part of that struggle will be over soon. Everyone struggles with something at some point, but attitude can truly influence the outcome. That she had only one hair on her head. So she did, and she had a fun, fun day. That there wasn't a single hair on her head. So that this blog doesn't become a place to just document and update goals and resolutions, it's time to post about something else. So, how about writing about our future trip to the International Space Station. - hiking for three hours in freezing cold weather at night. - walking through cement tunnels under the road. - buying snow pants for myself at the age of 36. - lifting light post covers. - taking on dares and documenting them in photos. Those who know me know that the list could go on. They also know the reason for the craziness! GEOCACHING! Recently published on the geocaching website was the cache furthest from home. It happens to be hidden at the International Space Station. Out of this World Cache! Obviously, we don't really have plans to visit the space station but it did make for a fun little discussion this evening. Me: There's a geocache in space now. J (Hubby): How do you get it? Moo: No way! I'm not going to get it! Do you know how many ways there are to die up there? I agree with Moo. I'm not so sure about going into space for a cache. We'll just have to stick to the earthbound caches for the moment! They are a lot of "phoon"! Here are my mini-goals for February. First of all, I want to get my Girl Scout receipts and checkbook in order. I have used some of my own money to pay for troop things and I need to gather up the receipts and pay myself back. This will make life easier when it's time to collect cookie money! My next mini-goal is to read two books over 100 pages long. I read a lot, but right now, it's mostly Facebook and that's really kind of sad in my opinion. I also read short magazine articles, but for the most part my reading sessions are quite short. I need to slow down a bit and enjoy a good book or two! Life goes fast. A whole month of 2010 is coming to a close in less than 36 hours. Because this is my life and my goals, I get to do this the way I want. So, I've decided to give myself full credit for the continuing contact goal and half credit for the keeping the table clear goal. After all, I did pretty well with that for about half a month. What happened the second half of the month with the table? Remember that life going fast thing? I can boil it down to about three things - report cards, getting new hamsters, and Girl Scout stuff. I know, all excuses, but that's how clutter happens. February mini-goals are in the works. I think I might know what they are, but I'm taking part of the next 36 hours to make sure! Goal #1 of keeping the table cleared off seems to be the bigger challenge of the two. Coming home from work mentally exhausted doesn't help. Of course I want to come in and just throw everything somewhere... and since the table is the first flat surface I come in contact with - there's where it goes. Having this as a goal, however, has made me more aware and the table is more clear on a daily basis than before. Goal #2 is why I write. I'm quite excited to say that I found out what I need to do to get a continuing contract. I've met most of the qualifications already. In March, I will have to write a brief letter about my current contract and then I can wait for board approval of the continuing contract in April. As far as January is concerned, I've done everything I can do for this goal! Mini-goal number 1 is to keep my table cleaned off and decluttered for January. Right now it looks absolutely beautiful. There is not a single thing on it. It's been close to clear for about a week. We had a Christmas party on Sunday and I cleaned it off for that. Since then I've tried to keep it cleaned. If you've ever heard of FlyLady, my table is what she would call a "hot spot" - places that collect clutter - a dumping ground for whatever we lug into the house. (I read the FlyLady book and website a lot a few years ago, but not much anymore - I still find many of her concepts extremely helpful though.) Keeping it cleared off would be a beautiful thing! Mini-goal number 2 is to get my paper work in to get a continuing contract for my job. This goal is about my tendency to procrastinate. This is not something I HAVE to have done in January. It could be done any time this year, the next, or even never. However doing it now will definately benefit me! Well... there it is the first two goals!